This statement about the number of children reaching the “expected level of development” is based on the results of the Early Years Foundation Stage Profile (EYFSP). Unfortunately for Save the Children, the EYFSP is not done at the start of school, it’s done at the end of the Foundation Stage. At this point the vast majority of children will have been in a Reception class in a school for a full year, with a fully qualified teacher, who will usually have qualified via the PGCE route (thus attaining QTS and being paid via the Qualified Teacher Payscale) rather than being taught by an Early Years Teacher. The report appears to acknowledge this later on, when it says “almost all school-based early years settings are led by teachers with QTS”. This is given as the reason why the report focuses on PVI settings (although I’m not sure why it decides also to wipe childminders out of the sector, by not mentioning home based settings once). The confusion between Reception classes and early years settings happens again in Section One of the report, where it is stated that “Figure 1 shows that in 2014/15 one in three children (34%) started school without reaching a good level of early development.” Again, these children are not starting school at this point, they are moving into Key Stage One. While attendance in Reception is not statutory until the term after your child turns five, it’s fair to say that most readers would assume that when a report says “started school” they mean “started school” as opposed to “reached the age for statutory full time education”. The next page reinforces the error, adding a touch of moralising to the mix, and (as is the fashion these days) suggesting that it is the fault of educators that social mobility doesn’t happen. “Allowing so many of our children to start their school careers behind in crucial skills makes us all complicit in the persistence of poor social mobility in our country.” Leaving aside the question of whether or not the EYFSP is a good measure of “crucial skills”, the fact that the children being measured here are up to 25% apart in age is ignored. The next part of the report moves onto safer, if rather dated, territory, with the mention of the Effective Provision of Pre-School Education (EPPE) report. (A piece of research that has been going on for so long that it is now called EPPSE to indicate that it includes secondary education.) Yes, of course good quality early years provision can make a fantastic difference to children. Yes, of course we’d all love to have well trained staff. But the problem is not PVI settings, nor schools, the problem is funding. If our setting were to employ a teacher with QTS, on the Qualified Teacher Payscale, we would need to pay out almost our entire turnover to a single member of staff. Luckily for us, our wonderful and highly qualified Early Years Professional (EYP) leader is willing to work for much less. Awkwardly, the report then starts quoting estimated tax revenue based on attending childcare, using figures that seem to suggest parents are being mean to the Chancellor if they keep their children at home when they are young. “Attending childcare leads to a benefit over a lifetime of around £11,000 to the exchequer”. Perhaps this is an attempt to show the government that childcare is worth the investment, but using such figures feels oddly misplaced to me. At this point, things get really complicated, because the report tries to unpick the differences in outcomes between children attending childcare in deprived areas, and those attending childcare in areas of more affluence. The findings quoted make for interesting reading. The implication seems to be that parents hold you back, childcare brings you on, and a qualified member of staff brings you on a little bit quicker. While I’m no expert at interpreting data, a difference of 4% seems small to me. I was quite surprised to find so much was being made of it, while none was being made of the much larger gap between attending a setting and no childcare at all: “compared with a child who attends a setting with a highly qualified member of staff at age two and age three, a child who attends no childcare is 36% less likely to reach a good level of development, and a child who attends a nursery without a highly qualified member of staff is 4% less likely to reach a good level of development”. I’m not clear what the report is suggesting here, as it makes only passing reference to children’s centres and supporting parents in other ways. Next the report identifies some aspects of good quality childcare that don’t really seem to me to be dependent on a high level of staff qualifications – we’re all clear, I think, that songs, play, games and so on are beneficial for small children’s learning. In the second section we are told that “most settings don’t have an early years teacher”. (I’d imagine this might be because it’s a fairly new qualification, so there are hardly any EYTs, and the qualification doesn’t come with QTS, so why not just do a PGCE?) We are told that “areas that are struggling most with nursery teacher provision in the private, voluntary and independent sector are much more likely to be characterised by low levels of employment, education and income than other areas” and that London does best of all. Let’s face it, in an affluent area parents can fundraise to support their local childcare setting, and may well have more time and experience to offer as trustees of a voluntary run setting. In an affluent area, where babies are more likely to be in childcare because of both parents working, then settings can ‘top up’ their funding via fees. Finally, a bit late in the day, overall rates of funding are mentioned: “On average, local authorities in the top 20% received £4,558 per child, for the free childcare entitlement compared with local authorities in the bottom 20% who received £4,192 per child.” Yes, the reason why it’s so hard to employ a qualified teacher is because we don’t get given enough money to do so*. However, unless funding changes, I’m not sure that any of these challenges can possibly be met, and especially not with the increased costs that have been and will be caused by auto enrol pensions, the living wage, and the 30 hours offer. Finally, Save the Children lays down the gauntlet to the government to invest more in getting highly qualified staff into deprived areas. I don’t think there’s anyone in the early years sector who would disagree with what they ask for in this part of the report. However, at a time when the government is expanding ‘free’ childcare and pushing settings to deliver this on what is effectively even less funding, I’m not convinced this is ever likely to happen. Worryingly, if we do “ensure EYT status is fully equivalent to QTS” then I don’t know how settings are going to be able to afford to pay their EYTs once the subsidy finishes. Perhaps my main worry about this report, though, is the sense that there is hardly any focus on what is best for children. While trying to find ways to ‘close the gap’ in the sense of social mobility via education, we really must not lose sight of the fact that ‘what is best’ is not necessarily ‘what gets the best test results/the most income for the exchequer’. To summarise, at the moment, all this “free childcare” is subsidised on the back of a workforce of badly paid, mostly female workers. Oh, and people like me who give up their free time to voluntarily run one of those PVI settings that seem to get such a slating in this report. We don’t have more highly qualified staff in PVI settings because we can’t afford them. And sadly, despite what I’m sure were good intentions, I’m not convinced that this report will do anything to change that. * The figures quoted in the Report are not based on the funding that settings receive, but on the funding that is given to the Local Authority. This is not all passed on to settings. Our setting receives £2,040 a year for each funded child. This entry was posted in Children, Early Years, EYFS, Preschools. Bookmark the permalink. Well said. The uncomfortable inference is that PVI are not delivering high quality, when in fact the number of good and outstanding early years providers is increasing, indicating that the current workforce is delivering a lot of high quality provision which children are benefitting from. Surly this indicates that the current workforce is delivering a lot of high quality provision (or has Ofsted got it wrong?) despite the lack of career structure and pay and conditions which are comparable with the public sector. What we do not want to see is the development [or promotion] of a two- tier system, which implies that the private, voluntary and independent (PVI) sector is staffed by little more than well-intentioned amateurs when, in truth it, is the hot house for the whole childcare sector, supporting the workforce at great cost, to higher and higher levels of academic achievement and providing practical/operational expertise in a diverse sector, only for those same people, who rightly wish to have any form of career progression and job security, leave to work in school-based provision. Given the current recruitment crisis in Early Years, those currently in the workforce must be championed – nurtured and given incentives to stay in the sector. If they do not, a wealth of skills and knowledge will be lost. The skills, expertise and caring nature of the early years workforce has been taken advantage of for too long. Thanks Deborah. I’d agree with everything you say. I found myself surprised to see the report making so much of such a tiny gap, when funding is so different between LA areas and the PVI/school sectors. Yes, I am concerned about how this reflects on the current workforce, especially given the issues of recruitment and retention. 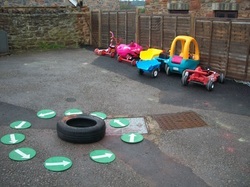 Hi Sue, I am currently training on the EYITT course which will make me an Early Years Teacher (EYT) in July next year. I have 27 years experience as a TA and 3 years as a HLTA under my belt – 30 years in total, and at the end of my course I will still not have QTS. However, I have had to meet all the criteria needed to train as a teacher……a degree, GCSE Maths, English and Science as well as both of my Professional Skills Tests – I am highly skilled in my profession – it is so wrong!. GIVE ME QTS!!!!! Yes, our EYP had exactly the same. It is so frustrating that we cannot pay our staff on the QTS scale, and I think this is probably the main reason they won’t link it to EYITT, because they would have to fund EY properly. I have said to people asking that I would advise them to do a PGCE instead, to ensure QTS and fair pay. Both our children attended their local playgroup for their pre-school year rather than the school nursery. I honestly don’t see what difference a degree would make to how well an experienced early year worker interacts with children in a typical session. When a new child is screaming for their mum, another is desperate for the toilet and someone has just knocked the water table over you don’t grow an extra pair of hands if you are degree qualified. A lot of parents just want a nice environment for their children to mix with other children and get used to spending time away from us outside the family home. I also think the EYFSP is a very flawed thing. My eldest scraped a pass with everything expected, one below (imagination) and one above (reading) to give a score of 36. After 6 weeks in Year 1 her new teacher was saying what an imaginative child she was and how good her artwork/stories were. Yet weeks earlier her imagination was apparently below the standards expected of a child of her age. Call me cynical, but I’m wondering who is behind this report and if Save The Children has a big-business nursery funding this campaign. The report seems to be written to meet an agenda. Interesting reading ! I am just wondering where all the money quoted is going. The figures state that LEA’s get £4558 that should equate to around £8.76 per child per hour, why then is my setting receiving £4,13 per hour? Perhaps Save the Children could spend their time working that out! If they are going to quote figures like this to the general public perhaps they could inform them properly about what we actually receive. Hi, yes, I thought that as well. Our hourly rate is £3.58 and has been for several years! I wonder if it is an average including the rates paid to schools, who obviously get more? I could rant forever about this!! I have friends & relatives working in nurseries, my kids go to a fantastic pre school with a huge focus on play & lots of fundraising going on. They were with me until their free hours aged 3, sorry Mr Exchequer. It completely undermines hardworking child carers (especially child minders) and seems to have little mention of children other than what they’re worth in monetary terms. It also seems to under value early years qualifications. Having a SEND kid i can already see that they are of little value to the powers that be, they are merely a drain on resources. Fortunately that isn’t how our dedicated pre school staff & now reception staff see them.